New Products! 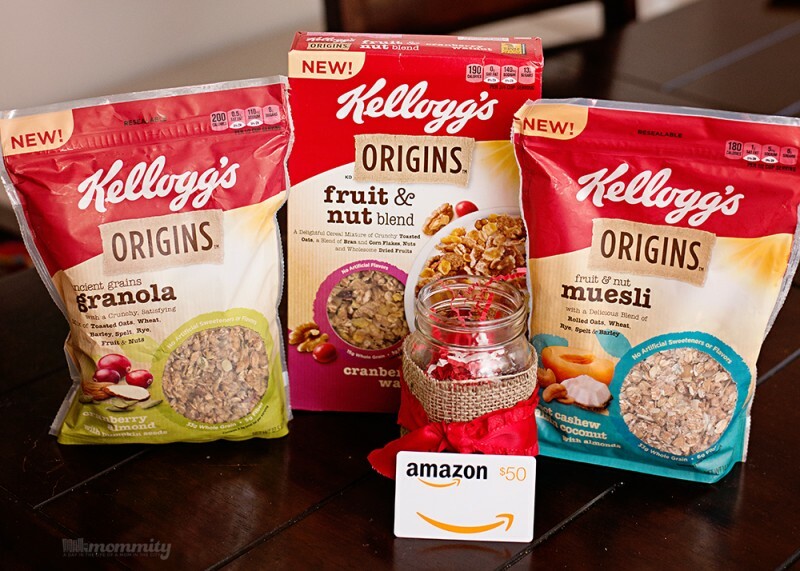 Kellogg's Origins Cereals, Granola & Museli - $50 Amazon GC Giveaway! Healthy eating is a new trend in my house. Since last year, we’ve cut out junky cereals, “trigger” treats, soda pop and a few other problem foods. This process was rather easy, though breakfast seems to be one of the hardest meals for me. Oatmeal gets boring, eggs get rather mundane too, so when I saw the new Kellogg’s Origins line of products my tastebuds started drooling. We have nut allergies in our house and these are not safe with a nut allergy, however; my husband and I have been enjoying the Fruit & Nut Muesli : Apricot Cashew Raisin Coconut with Almonds, Fruit & Nut Blend : Cranberry Walnut and the Ancient Grains Granola : Cranberry Almond with Pumpkin Seeds. 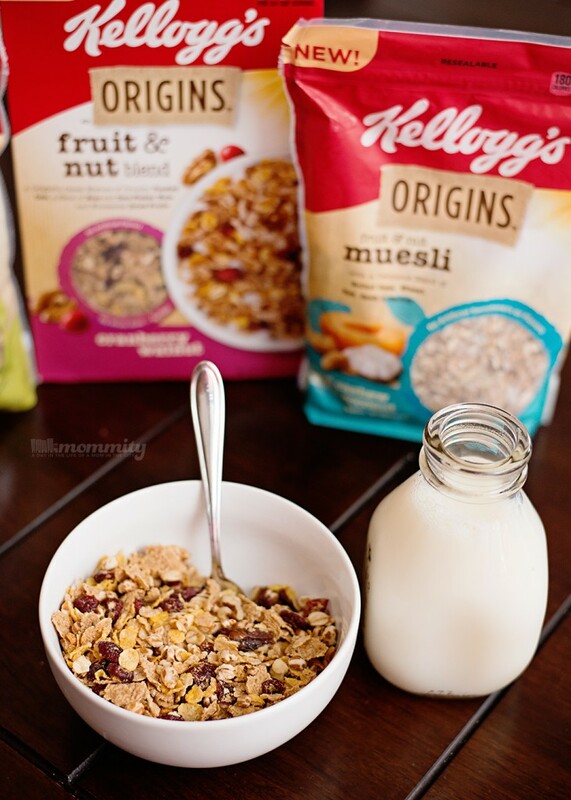 The new Origins line from Kellogg’s blends European traditions, such as hearty muesli, with the textures of ancient grains and the distinct flavors of apricots and coconuts. My favorite breakfast this week actually came from the Kellogg’s Origins Fruit and Nut blend cereal! It makes me feel better knowing that I can enjoy a wholesome cereal, without added sweeteners and it’s full of great fiber and whole grains. We like to make our own granola bars, adding healthier ingredients and more protein. The Kellogg’s Origins Ancient Grains Granola – Cranberry Almond with Pumpkin Seeds is the perfect addition to our granola bar recipe. This screams fall to me! I’ve been snacking on the granola by itself, but looking forward to including it into some of our favorite fall recipes. Kellogg’s Origins products are available for a suggested retail price of $4.59 or 2 for $6.00 at select retailers nationwide. Disclosure – Thank you to Kellogg’s for sponsoring this post. As always, all thoughts are my own. 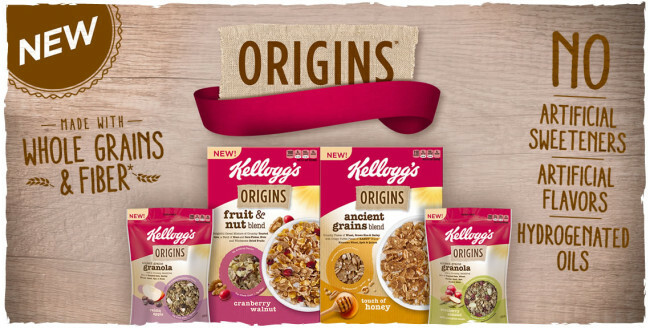 To celebrate the new Kellogg’s Origins product line, we are giving away a fun prize pack for one of you to try it too! 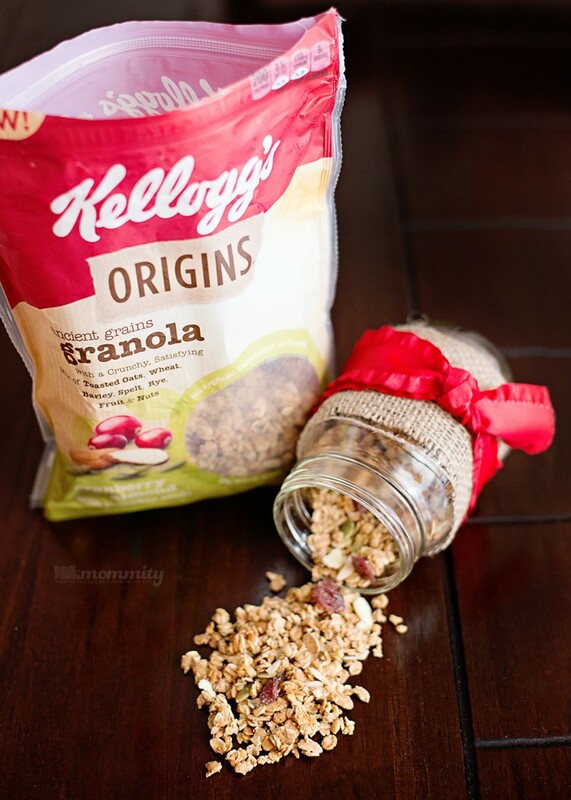 HOW TO ENTER: The Kellogg’s Origins™ Blogger Giveaway (“Giveaway”) is an online-only Giveaway. Giveaway begins on 5:00:00 PM (ET) on 8/3/15 and ends at 12:00:00 PM (ET) on 8/9/15 (“Promotion Period”). To enter the Giveaway, go to www.mommity.com during the Promotion Period and follow the online instructions to complete your entry. Entry into the Giveaway is free. All entries become the property of Mommity (“Sponsor”), will not be returned and may be shared with Kellogg Company for promotional purposes. Limit one (1) entry per person for the Giveaway – regardless of number of blogs visited. In the event of a dispute regarding entries, any entries will be deemed to have been submitted by the Authorized Account Holder of the email address submitted at the time of entry, provided that person meets all eligibility requirements set forth in these Official Rules. “Authorized Account Holder” means the natural person who is assigned to an email address by an Internet access provider, online service provider, or other organization that is responsible for assigning e-mail addresses for the domain associated with the submitted e-mail address. Entrants may not participate with multiple e-mail addresses, nor may entrants use any device or artifice to enter multiple times or as multiple entrants. Any entrant who attempts to enter with multiple e-mail addresses, under multiple identities or uses any other device or artifice to enter multiple times will be disqualified from participation in the Giveaway and all entries submitted by that entrant will be void. Only fully completed entries are eligible. Proof of submission will not be deemed to be proof of receipt by Sponsor. Sponsor is not responsible for any change of mailing address, email address, and/or telephone number of entrants. 2. ELIGIBILITY: Open to legal residents of the fifty (50) United States and District of Columbia who are 18 years of age or older at time of entry. Employees of (INSERT BLOGGER’S NAME), Kellogg Company, their respective affiliates, subsidiaries, advertising and promotion agencies and their immediate family members and/or those living in the same household of each are not eligible to participate. 3. WINNER SELECTION: Winner will be selected in a random drawing using www.random.org no later than 8/9/15 from among all eligible entries received by the Sponsor or its designee, whose decisions are final and binding. Winner will be notified by email. In the event the Sponsor is unable to contact the winner within forty-eight (48) hours of first notification attempt, prize will be forfeited and an alternate winner may be selected. 4. PRIZE/APPROXIMATE RETAIL VALUE (ARV)/ODDS: One (1) Grand Prize – Winner will receive a Kellogg’s Origins™ Prize Pack consisting of: three (3) new Kellogg’s Origins™ products (one (1) of each of the following: cereal; granola; and mueslis); one (1) $50 Amazon Gift Card; and one (1) Mason Jar. Total ARV of prize $68.36. Gift card is subject to the terms and conditions associated with it use. Odds of winning depend on total number of eligible entries received. Unclaimed prize will not be awarded. All applicable federal, state, and local taxes on prize are the sole responsibility of the prize winner. Limit one (1) prize per person for each Blogger Giveaway. 5. GENERAL: If prize notification or prize is returned as non-deliverable, prize may be forfeited and an alternate winner may be selected. No correspondence will be acknowledged. No cash equivalents, substitutions or transfer of prize permitted. Subject to all federal, state and local laws/regulations. Neither Sponsor, Kellogg Company, Mommity, their respective subsidiaries, affiliates, advertising, promotion agencies nor their employees will have any liability whatsoever for any injuries, losses or damages of any kind caused by any prize or resulting from acceptance, possession, use and/or misuse of any prize or participation in the Giveaway or any prize-related activities. Acceptance of a prize shall be construed as and signify the winner’s agreement and consent that Sponsor and Kellogg Company may use the winner’s name, voice, likeness and/or prize information, without limitation, for promotional purposes without further consideration, review, approval or payment, where allowed by law. By participating in this Giveaway, entrants agree to be bound by the Official Rules and the decisions of the Sponsor, which are final and binding in all respects. Sponsor not responsible for any typographical or other error in the printing of the offer or in administration of the Giveaway. 6. LIMITATIONS AND RELEASES: Sponsor is not responsible for lost, late, mutilated or illegible entries nor for electronic transmission errors resulting in omission, interruption, deletion, defect, delay in operations or transmission, theft or destruction or unauthorized access to or alterations of entry materials, or for technical, network, telephone equipment, electronic, computer, hardware or software malfunctions or limitations of any kind, or inaccurate transmissions of or failure to receive entry information by Sponsor or presenter on account of technical problems or traffic congestion on the Internet or at any website or any combination thereof. If for any reason the Internet portion of the program is not capable of running as planned, including infection by computer virus, bugs, tampering, unauthorized intervention, fraud, technical failures, or any other causes beyond the control of the Sponsor which corrupt or affect the administration, security, fairness, integrity, or proper conduct of this Giveaway, the Sponsor reserves the right at its sole discretion, to disqualify any individual who tampers with the entry process, and to cancel, terminate, modify or suspend the Internet portion of the Giveaway and select the winner by random drawing from among all eligible entries received from all methods combined up to the point of the action taken by the Sponsor. Caution: Any attempt by any person to deliberately damage any website or undermine the legitimate operation of the Giveaway is a violation of criminal and civil laws and should such an attempt be made, Sponsor reserves the right to seek damages from any such person to the fullest extent of the law. ®, ™, © 2015 Kellogg NA Co. Kellogg Company is not a sponsor or co-sponsor of this Giveaway and is no way responsible for the administration of this promotion by the blogger and/or the verification of the winner. Kellogg Company is the prize provider in this Giveaway; and its fulfillment agency will fulfill the prizes to the winners. ← Scholastic Summer Reading Challenge – Book Package Giveaway! Help the Environment & Be a Backyard Superhero!